Hi, Fireflies! 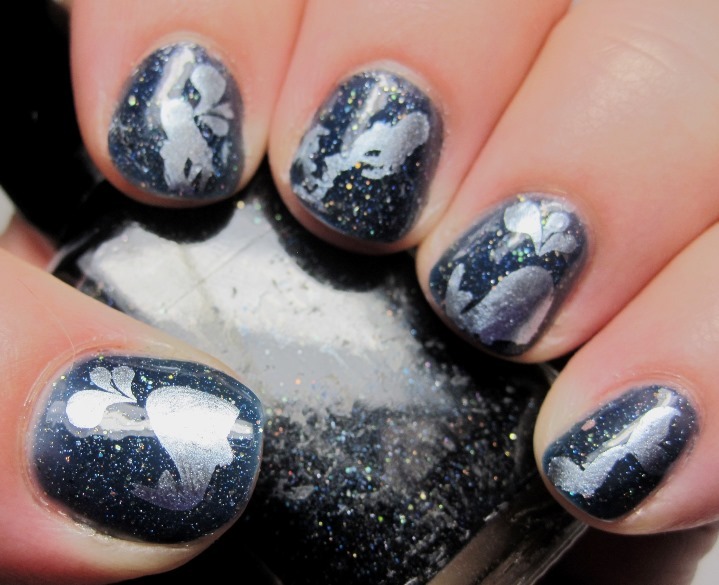 This gorgeous blue jelly sprinkled with holo glitter is called Night Stroll, by Daphine Polish. My fave color is Midnight Blue, but it's so hard to capture in polish because it can so easily go too far into black. This one comes pretty close. Being a jelly, it doesn't get too dark too quickly. It actually took about 4 coats to get this opaque. I thought these whale and mermaid stamps from Winstonia were pretty cute, so instead of just a Night Stroll, we can go for a night swim. The stamp was done with Essie Blue Rhapsody. This next polish was so hard to photograph, I can't do it justice. This polish is a greenish gold shimmer, that almost comes across as a duochrome with glitters. It's part of her Daria collex, and references a bizarre news show. 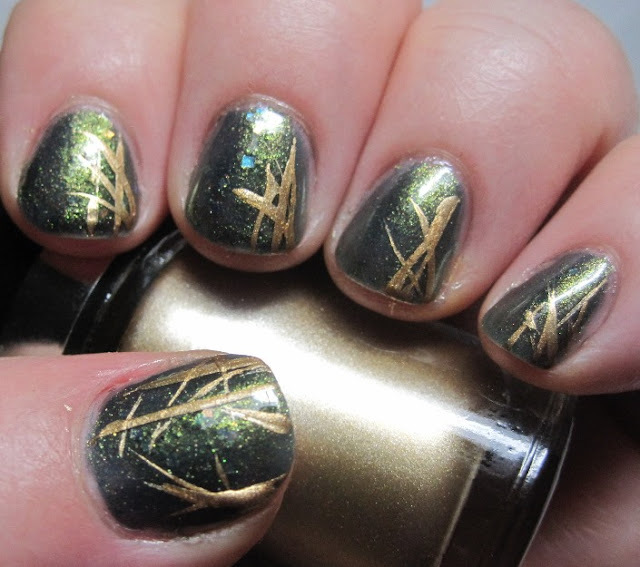 I decided to do an abstract gold bamboo stalk, so I took my trusty Maybelline Bold Gold and a long striper, and made some art. I love how it turned out. So easy to do, too! This polish has such depth, it makes everything look good. As I said in my review yesterday, I thought that the formula on this new Indie was really good. I loved the colors, too. I only have two critiques: one, she packed the bottles in sticky bubble wrap, so the bottles all have sticky residue on them. 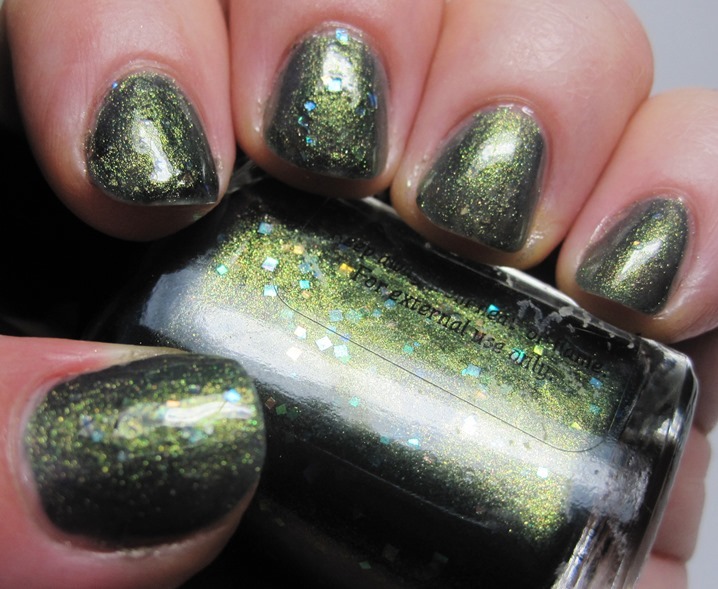 And, two, all of her labels have black writing, which makes it hard to read some of the labels over darker polish. I've already been in touch with her, though, and she's getting rid of the sticky bubble wrap, and will get more labels as her shop expands. If you'd like more information about Daphine Polish, you can find her on Facebook and her Etsy shop. *Update 8.23.13* Daphine has let me know that she has new white labels available! Summer Challenge - Last Hurrah! This new Orly collex is...Surreal! Sunday Stamping - Free for all! EcoPolo challenge - Sheswai Sunburn! Ruby White Tips- Oh, the shimmer! The Dark Side Has... Unicorns? I'm seeing red - Llarowe holo red!